The seemingly endless reports of data breach and leaks are a strong confirmation that the security technology we are using to protect our data no longer serves its function, so says a white paper released by Dell SecureWorks. The lengthy technical paper “Better security for better business” – because in-depth and detailed – outlines Dell’s approach to securing an IT infrastructure and breaking the old cocoon that confines organizations within ineffective and inefficient security methods. Security is a multi-faceted technological issue, calling for a variety of solutions from multiple vendors in order to address myriad of threats. But there’s one point on which these facets converge: the IT security foundation is increasingly bombarded by advanced threats that overwhelm standard response measures. What can security providers do to respond quickly to cyber attacks? Many security providers have focused on developing tools that try to address what Dell SecureWorks calls the narrow aspects of security such as intrusion detection, application security, and identity and access management. However, the white paper says that this fragmented market contributes to the lack of success for most security measures in place because it is based on a false idea of how to respond to threats at any rate. Some extensive security tools are often incapable of adapting to the unique demands of clients and cost too much to manage and maintain, in the process defeating the very objectives for which the enterprise has purchased them. Having analyzed the performance of security solutions currently available in the market, the white paper has stressed the shortcomings of existing IT security approach and has come up with a fresh set of pillars of IT security, namely “protect,” “comply” and “enable.” The concept of these fundamental imperatives builds upon the need for combining the fractured aspects of IT security into an integrated tool that enables sharing of insights across an organization. The problem with current security solutions, Dell SecureWorks laments, is that they put data in silos, making it practically unavailable whenever it is needed. Elliot Lewis, chief security architect of Dell Software at Dell SecureWorks, suggests that firewalls must share information with identity and access management software tools in order to allow data to move freely while achieving a proactive and predictive approach to threat detection, a great leap from the reactive method. What Dell SecureWorks envisions to develop in the future is a security service that embeds rules and policies into the data itself, Lewis notes. And doing so would enable a seamless alert system whenever sensitive information is under threat. 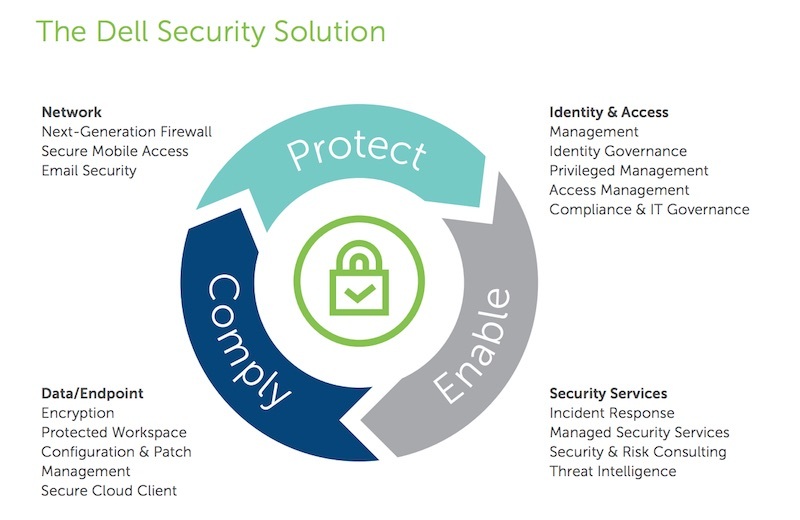 If you are interested in the topic, find out more on Dell Endpoint Security. Disclosure: This post is brought to you by Dell. All opinions are 100% mine.